Brief: A submarine communications cable is a cable laid on the sea bed between land-based stations to carry telecommunication signals across stretches of ocean. The first submarine communications cables, laid in the 1850s, carried telegraphy traffic. Subsequent generations of cables carried telephone traffic, then data communications traffic. Modern cables use optical fiber technology to carry digital data, which includes telephone, Internet and private data traffic. Modern cables are typically about 1 inch (25 mm) in diameter and weigh around 2.5 tons per mile (1.4 tonnes per km) for the deep-sea sections which comprise the majority of the run, although larger and heavier cables are used for shallow-water sections near shore. Submarine cables connected all the world's continents except Antarctica when Java was connected to Darwin, Northern Territory, Australia in 1871 in anticipation of the completion of the Australian Overland Telegraph Line in 1872 connecting to Adelaide, South Australia and thence to the rest of Australia. Full Story: The modern system of undersea cables has its roots in the telegraph. The first transatlantic communications cable was completed in the summer of 1858, running under the ocean between Ireland and Newfoundland. The first "official," non-test message was sent from Queen Victoria to President James Buchanan — and it was hardly instantaneous: The 509-letter message took 17 hours and 40 minutes to transmit across the Atlantic. But that was significantly faster than waiting for a ship to traverse the ocean. That cable took four years to build and lasted for less than a month. It took another six years before another line was set up so telegraph messages could cross the Atlantic again. But it proved that the concept could work, and over time a web of such cables spread underneath the world's oceans. Telephone cables later joined the telegraph cables and eventually the fibre-optic cables that the Internet relies on today made it to the ocean floor. Just how big is this network? 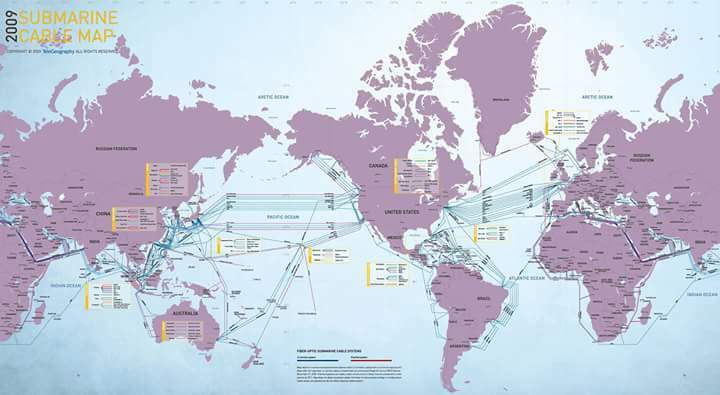 TeleGeography lists nearly 350 cables — some cross oceans, others follow coasts down along continents. The whole network of submarine cables spans more than 550,00 miles, with some being buried as far underwater as Mount Everest towers above ground. The cables connect to "landing stations" along the seaboard. Massive cable-laying ships go on voyages to lay the fibre along the ocean floor —plowing across the sea floor to bury the cables. Naturally, their courses are plotted to run along flat seabed as much as possible, avoiding coral reefs and ship wrecks as well the deep trenches or undersea mountains. Historically, undersea cables were paid for by telecom consortiums. But in recent years, tech companies like Google and Microsoft started getting in on the game, putting big bucks behind the infrastructure that's made the shift to an always connected world possible. What do the cables actually look like? On the inside, they have a core made of layers of fibre and wires covered in a protective layer to keep the ocean out. The cables are are several inches thick when they are near shore -- around the width of a soda can. At the deepest levels of the ocean, they are thinner, around the size of a quarter. That difference in size is because the cables actually face more threats in shallow waters, including everything from fishing ships to sharks. Fish, including sharks, have a long history of biting cables as identified from teeth embedded in cable sheathings. Barracuda, shallow- and deep-water sharks and others have been identified as causes of cable failure. Bites tend to penetrate the cable insulation, allowing the power conductor to ground with seawater. But cable-layers have adapted: The cables Google is helping build feature a kevlar-like protective layer to fend off the toothy sea creatures. Human error is a major factor. In more than one case, an errant anchor has disrupted submarine cables — an issue that can be particularly difficult for developing nations that may have few links to the global Internet. In 2012, two separate shipping incidents severed cables linking East Africa to the Middle East and Europe within the span of a month, according to the Wall Street Journal. The incidents caused major telecommunications outages in at least nine countries. When even accidents can cause major problems, it's understandable that government officials might fear actual attacks — especially given how reliant many functions of our modern economy are on near-instantaneous communication. But the United States has a long history of using undersea cables for its own tactical advantage — albeit through espionage rather than destruction. Back in the Cold War, the National Security Agency ran an operation dubbed "Ivy Bells" that tapped into communications links between two Soviet naval bases off of Russia's eastern coast. The project, which used submarines and waterproof recording pods that divers would return to gather every few weeks, ended in 1981 when an NSA employee sold information about it to Soviet intelligence officials. In more recent years, documents from former government contractor Edward Snowden suggested that the spy agency was accessing data from undersea fibre-optic cables as part of its global surveillance efforts.